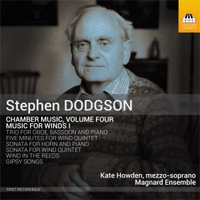 Description: Another cross-section of Dodgson's large output of chamber music, this time concentrating on winds, not least his own instrument, the French horn. Resolutely tonal, Dodgson's music is always characterful and impeccably crafted, with an unmistakable 'Englishness' and subtle touches of humor. The Horn Sonata is a substantial, serious specimen. The first movement is a dramatic preface to the static slow movement, with its sense of autumnal English landscape, and the variation finale which makes up almost half the work. The Trio is also of significant scale, again just shy of 20 minutes. This work has some unconventional and original elements, not least the fleet nocturnal scherzo in which the instruments' parts are written in different rhythms and meters. Again, the piece is in three movements with a finale in the form of variations, and a brief prefatory first movement with the insouciance and elegance of Poulenc. Wind in the Reeds and Five Minutes are small suites of witty miniatures, playful and picturesque. The songs set texts from Ben Jonson’s masque 'The Gypsies Metamorphosed', full of pungent parody and irony, which is reflected in the rather dark, ambiguous nature of the music, with the clarinet sometimes seeming to comment ironically on the vocal part, with which it shares an intimate dialogue. Kate Howden (mezzo), Magnard Ensemble.